Help fight hunger in our community! 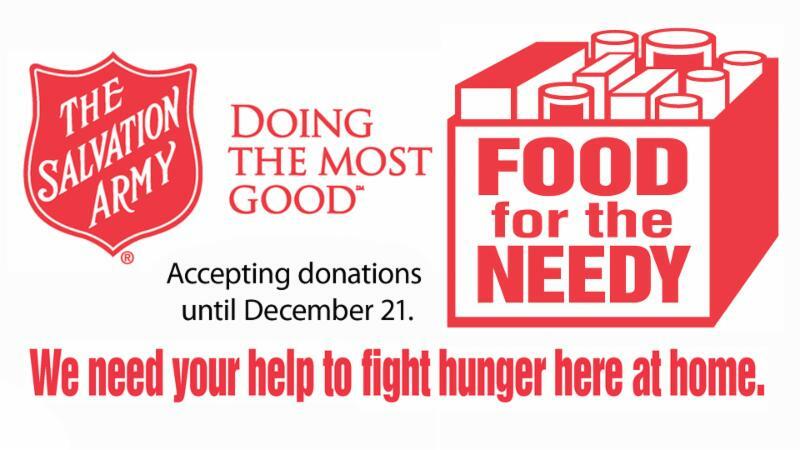 The library is a drop off center for the Salvation Army Food Pantry. We are accepting donations until December 21. Do you remember all the evenings spent at the dinner table with your family? Maybe your mom was yelling at you to finish your peas (gross), or maybe your sister was kicking you under the table. Maybe that's where you found out your dad got a promotion, or maybe that's where your older brother opened his first college acceptance letter. Maybe it's where you laughed so hard at your dad's cheesy jokes that milk came out of your nose. The bottom line: lasting memories are created at the dinner table. If there's one thing that brings people together, it's food. But, for some, food can be a sore subject with painful memories. Grocery money can be hard to come by. Some families in our community are forced to choose between paying bills and eating dinner.